A month before the festival kicks off, in Brighton, The Great Escape Festival has announced its full line-up for this year’s edition, as well as revealing 100 additional acts that will also be performing at the festival. 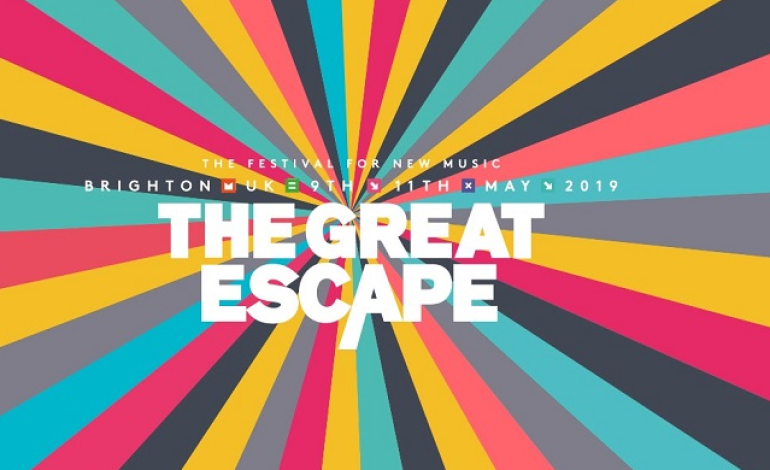 The music industry and music lovers alike will once again gather, in Brighton, this May for The Great Escape, the UK’s annual summertime festival for new music which showcases around 500 emerging artists from all over the world. The three-day event takes place across 35 venues in the city, between the 8th and 11th of May 2019, giving music lovers the chance to catch future stars and their next favourite musicians in small-scale settings, alongside panels, speeches, debates and more. Among the additional 100 artists revealed this week are YAK, Mount Kimbie, Black Honey, Pumarosa, Rosie Lowe and Izzie Gibbs. The final 100 artists + TGE19 scheduler have landed! @yak_band, @mountkimbie (DJ Set), @BLACKHONEYUK and more all join the bill, + the full scheduler is live via our app for your planning pleasure. They will be joining the likes of Foals, Lewis Capaldi, Anna Calvi, Frank Carter & the Rattlesnakes, Indoor Pets, Mini Mansions, The Amazons and Fat White Family. 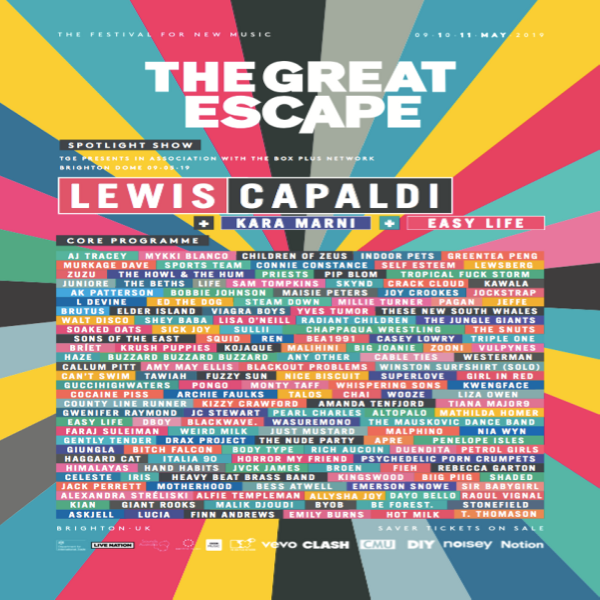 The announcement comes after it The Great Escape confirmed their spotlight shows, which are special standalone gigs that organisers believe deserve to be highlighted within their programme. This year’s edition of the festival will see the shows split into two separate spotlight shows, the first will take place on Thursday the 9th of May 2019, at Brighton Dome Concert Hall. The spotlight show will be headlined by Lewis Capaldi, who will be joined by Kara Marni and Easy Life. Meanwhile the Foals, are scheduled to perform a celebratory gig, that will celebrate 15 years of Transgressive Records at The Great Escape. The band will perform, on Friday the 10th of May 2019, at Concorde 2, and will be joined by Blaenavon and Boniface. Speaking about the history of Transgressive Records at The Great Escape, Transgressive Records co-founder, Toby L, said: “The Great Escape is easily one of the world’s most progressive and exciting showcase platforms and since Transgressive always endeavours to unearth and support brand new artists that offer something to say, it felt entirely apt to kickstart a year of parties, special releases and other birthday related gimmickry in Brighton at an event we’ve supported since its inception. Joining the already stellar line-up and headliners Foals and Lewis Capaldi are Allussinlove, Benedict, Benjamin, Black Honey, Broken Hands, Clara McHugh, Corella, cousin Tony’s Brand New Firebird, Ella Vos, Ellie Ford, Faye Webster, Halfnoise, I See Rivers, Inhaler, Joshua Burnside, Josiah & The Bonnevilles, Kroy, Lola Young, Lxandra, Mae Muller, Max Rad, Mush, Pumarosa, Ralph TV, Rosie Lowe, The Visual, Thorsteinn Einarsson, Warhola, and Wild Youth. The following names have also been announced this week and joining the already impressive line-up is Abakos, Amaria, BadGirl$, Berwyn Du Bois, Big Heath, Big Zuu, Emiko, Gigi Lo, Haviah Mighty, Izzie Gibbs, Just Banco, Kamakaze, Lava La Rue, Master Peace, Realz, Shawgz & Asha Jane, Conducta, Erika De Casier, Jnr Williams, Kadeem Tyrell, Kiana Lede, L U C Y, Necktr, Nine8 Collective, Pengshui, Ruthanne, and Shane Universe. Completing the line-up for this year’s Great Escape Festival is Andrra, Babii, Birthday Card, Chaouche, Declan J Donovan, Eadyth, Great Dad, HockeySmith, Jack Vallier, James Gillespie, Le Superhomard, Lorenzo Senni, Mind of a Dragon, Mount Kimbie, Neiked, Object Blue, Oliver Tree, Oteo, Patawawa, Peggy Sue, Ploy, Prep, Roe, Seazoo, Sharda, Swimming Girls, Thyla, Tiwayo, Valeras, Wuh Oh, False Advertising, garden Centre, Heavy Rapids, Hello Yello, Hotel Lux, J.S. Ondara, James Smith, Johnny Mafia, Jordan Prince, Kim Logan, King Nun, Melt Downer, Pinky Pinky, Ruby Fields, Skinny Living, and YAK. Among the artists performing at this year’s festival are a number of Scottish stars, including the incredible Lewis Capaldi, who will be joined by some of Scotland’s rising stars including Alligator, Aaron Smith, Cloth, Walt Disco, Heavy Rapids, Tamzene, OK Button, Lucia, Kobi Onyame, and The Snuts.